Does a Random Way to Get Rich Work? Every so often, I come across outstanding articles to share. Each of these posts answers a particular investment question. From technical investing, program trading by the pros to Sit’s exploration of how to classify your house, there are a potpourri of choices. My favorite is Bret Ahrends WSJ article, “A Random Way to Get Rich“. His investment claims are audacious, and throw hedge funds and most investment managers under the bus. If his claims are correct, a portfolio with just 2 funds can outperform the rest! Harry Sit of the Finance Buff asks, Is Your House an Asset or an Investment? Personally, when calculating our family net worth, I include our home because I like to see a bigger net worth. But, I have a trick, I depreciate the value, so I don’t list it at market value. It’s my way of trying to justify the reality that if we needed to liquidate all of our assets for some reason, I would be loathe to sell our home and live on the proceeds (unless there wasn’t an alternative). “The best investment benchmark for comparing performance can be found by combining 80 percent of the return from the MSCI All Country World Equal Weight Index and 20 percent of the return from Treasury bills. This, in effect, is what investors could have earned if they had just fired their money manager, put 80 percent of their money into a random collection of stocks from around the world and put the other 20 percent into Treasury bills. The Incidental Economist explains The Law of Diminishing Marginal Utility. This basic economic concept is taken from the new Microeconomics Made Simple, by Mike Piper and Austin Frakt. As a college econ major, I’ve been fascinated with this law (although I don’t think you can get arrested if you don’t follow it). Learn how it applies in most aspects of your life. And, buy the book, even if you already know about Microeconomics, it’s a nice refresher. Rick Ferri writes about how Technical Analysis Drags Down Performance. 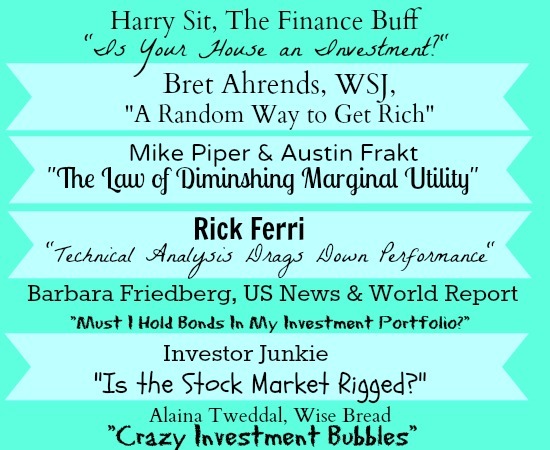 Alaina Tweddal wrote for Wise Bread, If you Think the Housing Bubble Was Bad; Check Out These Other Crazy Investment Bubbles. I’m overly interested in bubbles because when they break, they offer superb opportunities for investing. If you pay attention to valuations, and understand when an asset becomes overvalued, it’s only a matter of time that the tides will turn. After a bubble bursts, it’s a great time to go in and invest. I answer this question for U.S. News and World Report Readers, Must I Hold Bonds in My Investment Portfolio? I discuss the place of fixed income investments in your portfolio and give 4 ideas for the fixed portion of your asset class allocation. Of all of the fixed alternatives mentioned, Government I bonds are my favorite. But unfortunately, I bond investments have their drawbacks. Which article is your favorite, and why? Lots of great articles here. Thanks for sharing these with us! Nice collection Barbara! I’ve bookmarked this post and will be going through it to polish up my personal finances. Thanks for the post and sharing the article on WSJ. I just finished reading that too and it’s got me thinking. When I started investing myself I did something similar sort of choosing stocks in random based on a group of stocks that were high performers. I held on to them (through the recession) and the returns have been quite positive. I am curious now on how that would have compared to one provided by money manager. HI Jason, I would like to do some investigating into historical returns of the 2 fund idea in Ahrends article (the all world fund and a cash or short term bond fund). I plan to calculate annualized returns over various time periods and then compare with other index and actively managed fund. His idea is interesting, but I’d like to see some empirical evidence of his hypothesis.